It’s safe to say that when it came to break out TV shows over the 2016-17 TV season, there was none bigger than This Is Us. Created by Dan Fogelman (Crazy, Stupid, Love) the drama picked up stellar ratings and plenty of critical acclaim. The first season of the show averaged an incredible near 15 million viewers and critics waxed lyrical about it. At a time when the world is facing uncertain times and America has severe political unrest, This Is Us seemed to hit at exactly the right moment giving viewers an escape that they could relate to, laugh along with and cry at in equal measure. It’s actually pretty hard to review This Is Us without giving too much away. The success of the show relies on a central conceit that isn’t revealed until the end of the first episode. I’m going to try my best not spoil anything for those of you reading this that haven’t yet seen the show. Essentially the first episode introduces several characters who are celebrating their 30th birthdays – Jack (Milo Ventimiglia) whose wife Rebecca (Mandy Moore) is heavily pregnant, twins Kevin (Justin Hartley) and Kate (Chrissy Metz), and successful businessman Randall (Sterling K. Brown). What transpires over the course of the season shifts what you think the central premise is during the first episode. You follow the lives of these characters over a number of years with plenty of unexpected plot twists and jaw-dropping moments. 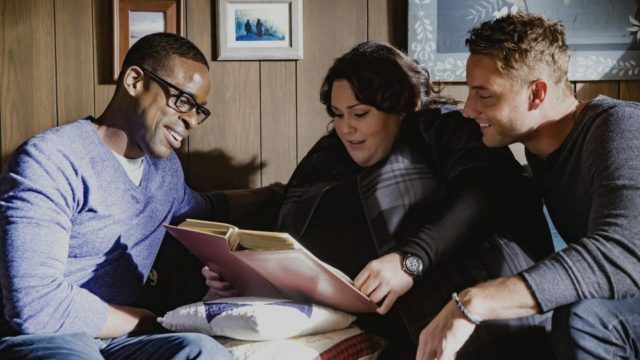 This Is Us creates a wonderful collection of characters that it impressively fleshes out during the 18 episodes of the season and it manages to make you care for all of them. I can’t count on one hand the amount of tears I shed. I became so invested in the show that I actually felt a sense of grief when the credits rolled on episode 18. One of the things that makes This Is Us the great show it is, is the ensemble cast. Sterling K. Brown, up until this point best-known for a stellar turn in The People v O.J. Simpson: American Crime Story, gives a career-defining performance here as Randall, a man who seemingly has the perfect life but has the wind knocked out of him when he connects with his biological father William (Ron Cephas Jones). Two of the most surprising performances come from Mandy Moore and Justin Hartley. Moore has done plenty of acting in her career but is primarily known as a former teen popstar. Her performance here is nothing short of exceptional and she’s finally found a role that showcases her impressive range. Hartley isn’t someone I’d ever considered to be a particularly great actor having come from a soap background but he proved me wrong. In a case of art imitating life, Hartley’s character Kevin is an actor on a terrible TV show who wants to prove he can actually act. Chrissy Metz, who plays Kevin’s twin and personal assistant Kate, is a real find for the show. She hadn’t done all that much prior to this show but she portrays the struggle of a plus sized woman in Los Angeles in a relatable and emotive way. Metz is such a talent and she makes Kate one of the characters you root for throughout the season. Milo Ventimiglia, who rose to fame in Gilmore Girls and Heroes, shows there more to his acting ability than we’ve seen before too taking on the most complex character of his career so far with Jack. He fosters a fantastic chemistry with Moore and like Hartley really surprised me. This Is Us has a fairly large supporting cast too with the excellent Susan Kelechi Watson as Randall’s wife Beth, Ron Cephas Jones tugging on every heartstring as William and Chris Sullivan making you feel feelings you didn’t know you had as Kate’s love interest Toby. The DVD release features The Aftershow, which is essentially a discussion show that accompanies every single episode and features members of the cast and crew. It gives a great insight into the show and it’s a real plus to have them all included here. This Is Us is exactly the kind of show the world needs now. It puts the focus back on human drama and doesn’t rely on dragons, special effects or complicated storylines to make its mark. If you were a fan of Brothers & Sisters or Parenthood, then you’ll likely love This Is Us. Even if you weren’t, I’d recommend giving the show a go and you may find it’ll surprise you. Just be prepared to reach for the tissues because there’s no way you’ll make it through the season without shedding plenty of tears.